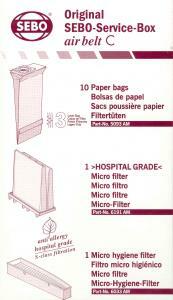 SEBO Service Box for C series canisters contains 10 bags, 1 Hopital-grade Microfilter, and 1 Micro-hygiene filter. Good company to deal with. Highly recommend.